Just under three years after Apple evicted Google Maps from iOS, Cupertino's own mapping and navigation offering still has some critical weaknesses. AppleInsider looks ahead at what the next 12 months could have in store for Apple Maps. User-facing changes to Apple Maps were few and far between in 2014. A revamped Maps app was expected to be one of iOS 8's tentpole features —boasting a wealth of new data and the long-awaited addition of public transit directions —but the most interesting modification of the year ended up being the introduction of nine new cities for the three-dimensional Flyover feature. Apple did eventually tap 10 new sources for business listings. The additions of DAC Group, Location3 Media, Marquette Group, Placeable, PositionTech, SIM Partners, SinglePlatform, UBL, Yext, and Yodle to the initial trio of Yelp, Factual, and Neustar/Localeze boosted the number of firms providing point-of-interest data to a baker's dozen. The most notable Apple Maps update of 2014 was adding the Grand Canyon to Flyover. In another data-related move, the company began a seemingly comprehensive data scrubbing program that included the launch of a self-serve Maps Connect portal allowing local businesses to directly add or modify listings and personal calls to business owners from Maps team members to reconcile conflicting data. Changes are now rolled out every day, rather than once a week. 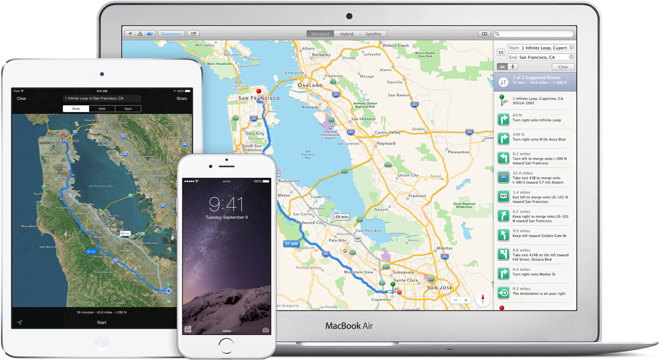 Apple Maps also made its web debut last year, powering the iCloud version of Find my iPhone. It hasn't yet propagated to all of Apple's web properties, however— the company's retail store driving directions are still powered by Google. Overall, 2014 seems to have been to the Maps team what Snow Leopard was to the OS X group: an opportunity to focus on behind-the-scenes tuneups that will underpin larger initiatives down the road. Though there is some debate as whether that was planned, Apple is known to be in the midst of "overhauling things front-to-back." 2015: We're gonna miss the train! So what does that mean for 2015 and iOS 9? If iOS 8 was Maps's Snow Leopard, iOS 9 could well be its Lion: the release that marks the beginning of a new age. Public transit: The most glaring omission in Apple Maps has always been and continues to be the lack of support for navigation routing that includes public transportation. With that functionality nowhere to be seen in iOS 8, it easily tops the list of "things Craig Federighi is most likely to announce at WWDC." Apple will almost certainly integrate the basic door-to-door pathfinding technology that it acquired by purchasing transit companies HopStop and Embark. Also likely to come along is HopStop's future trip planning, which would let users pre-plan journeys— for instance, they could compare cross-town rush hour routes at lunchtime— and Embark's heads-up notifications, which proactively ping users with route advisories and closures. 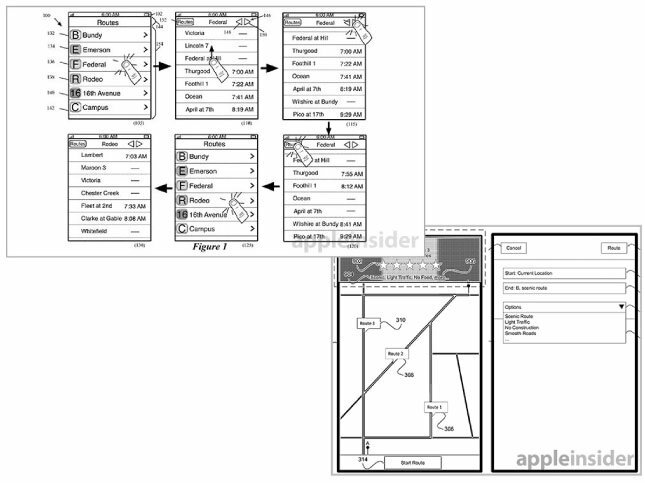 Apple provided a glimpse into its plans with a pair of patent applications that came to light last month. Those documents detail a dynamic routing system that functions as a sort of personal commuting assistant, gathering routing data, timetables, and information on amenities such as Wi-Fi availability in a single place. Apple's transit patents, left, and Waze-like traffic reporting, right. Crowdsourced traffic information: Apple is rumored to have offered around $500 million to acquire traffic app Waze in early 2013; Waze is believed to have wanted more, and Google eventually snapped up the Israeli company for nearly $1 billion. Apple still leverages Waze as one of multiple sources for realtime traffic data, but Cupertino appears focused on an in-house crowdsourcing push. One iOS developer who works primarily on mapping applications told AppleInsider that crowdsourced traffic data is seen as a "serious target" for Apple's Maps team. As Waze's success proved, active user reporting of traffic conditions has significant benefits over traditional passive device location monitoring, which is currently the primary method by which companies compile traffic data. That position is borne out by Apple patent applications that detail a system strikingly similar to Waze. Apple's approach would allow users to report accidents or other blockages and slowdowns, which would then be pushed to other drivers approaching the same area. Indoor location: Accurately identifying a user's location is becoming increasingly important as software and services attempt to provide more useful contextual information. This is a relatively easy task when the user is outdoors, or otherwise in range of a signal from GPS or GLONASS satellites; it's an entirely different matter when walls and a ceiling are in the way. Apple has taken two different but complimentary approaches to this problem. The first is the iBeacon system, which depends on small palm-sized Bluetooth transmitters placed around a particular space. When an iOS device sees an iBeacon, it can analyze the signal to determine approximately how far away from that beacon it is. Using multiple iBeacons with known locations, developers can roughly triangulate the user's position. This isn't very helpful on a large scale, however, since there is no central database of iBeacon locations— such data is by and large only usable by the owner of the beacons. To address the larger problem, Apple acquired small indoor mapping firm WiFiSLAM in early 2013. Before the acquisition, WiFiSLAM's team promised indoor location accuracy to within 2.5 meters. 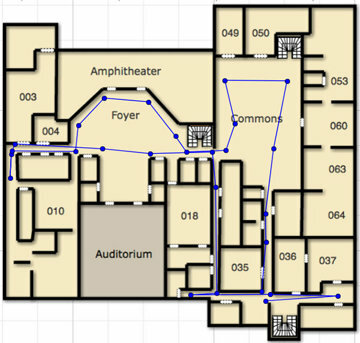 WiFiSLAM's technology combines data from on-device sensors with Wi-Fi signal trilateration to plot a user's path. The Wi-Fi signals provide relative positioning, while on-board sensors record movement. Here's an example: your iPhone could analyze the signal strength of Wi-Fi networks around your house to determine approximately how far you are from each access point. As you move around, the accelerometer, magnetometer, and gyroscope on the handset measure forces exerted by maneuvers like turning left and then right again to avoid a coffee table. Combining all of that data together over a period of time can bring detailed patterns to light; e.g. "there is an obstacle three feet from point A that can be avoided by moving left two feet." Extending that data capture and pattern recognition to many users— say, the thousands of iPhone owners that visit a shopping mall in a given day— allows for the development of detailed and highly accurate maps without the aid of overhead satellites or dedicated data gathering initiatives. A number of iOS developers polled by AppleInsider were split on whether detailed indoor location such as this would be included in iOS 9, though most did agree that it will likely make the cut for iOS 10. Apple could also choose to begin passively collecting this data now without exposing it to developers, building a data warehouse in preparation for a future release. It's not strictly a new feature, but Apple will almost certainly reveal improvements to its point-of-interest search in iOS 9. The company acquired social search startup Spotsetter last year, a deal thought to have been made to gain access to Spotsetter's recommendation technology. One possibility that was almost universally rejected by developers we spoke to was the availability of a web-based Maps API. Though Apple has already created one— as evidenced by its appearance in iCloud's Find my iPhone— it's likely to remain an internal tool. Another unlikely addition is a crowdsourced "street view" feature the company detailed in a patent issued last year. That system is seen as facing "hard computer science problems" that are yet to be solved. Of course, ever-secretive Apple could also be planning One More Thing that has yet to leak out of Infinite Loop.